I don’t know what it is but something about winter just makes me want to get house projects done. Ok let’s be honest, it makes me want to give projects to my husband to get done. I mean I help with the ones I can but he does all the heavy lifting and I provide the moral support (and the ideas). So far this winter we’ve done a lot of painting, replaced some light fixtures, refreshed our dining room and have been working hard on getting the nursery ready. I don’t know if it’s the cold weather that makes you want to stay indoors or all the HGTV I’ve been watching. Either way I’m full of ideas for my house. One area in my house where I have a million and one ideas is my kitchen. 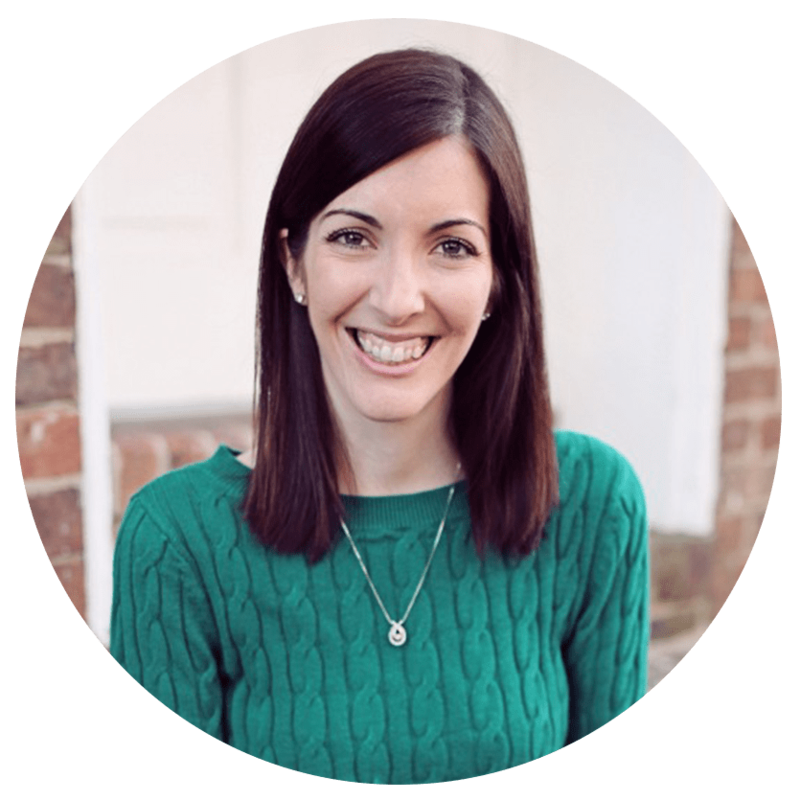 It works because they always say the kitchen is one place you get money back when you sell your house so we feel good investing in our kitchen but there is so much we want to do so it has to be a slow process. Today I wanted to share a few of my inspirations for my kitchen for things I’d love to replace! 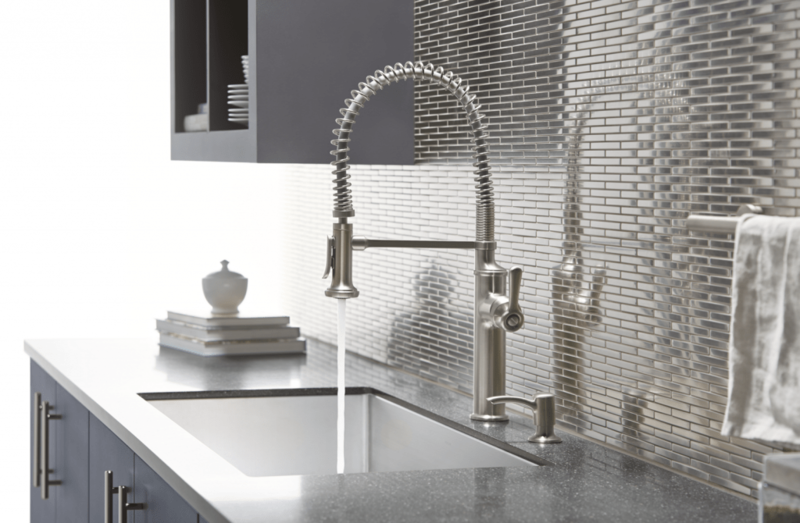 A new faucet– This one is high on my list. Parts of our kitchen, including the faucet are stuck in the 90’s and I’m ready to get out of the 90’s. 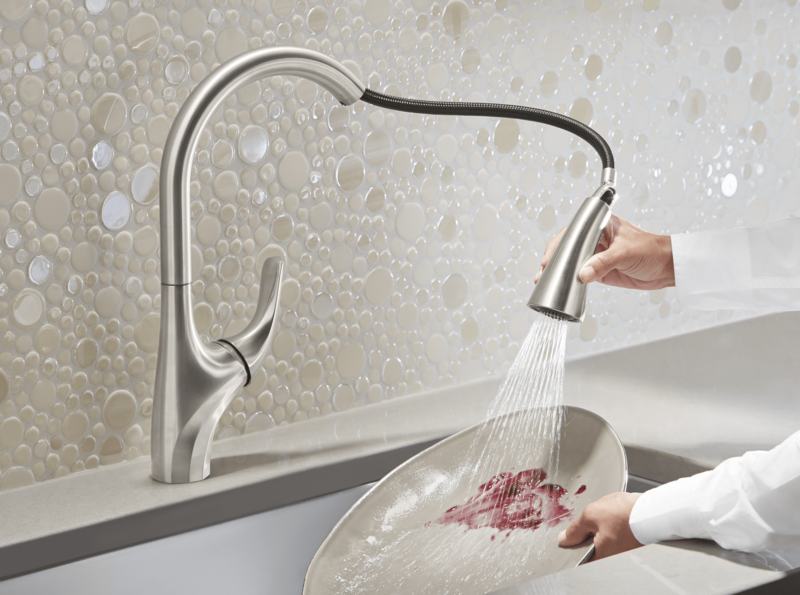 I picked out a few faucets that are exclusively available at Home Depot that I love! 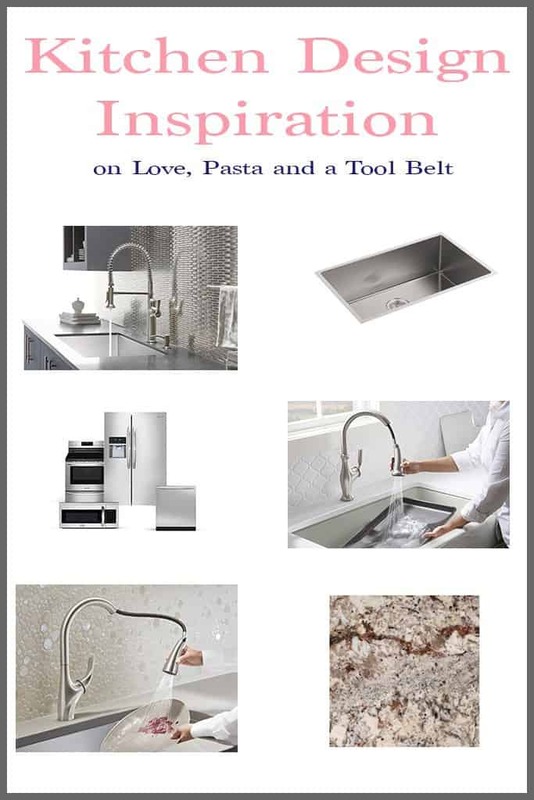 – Kohler Sous Kitchen Faucet – This faucet has a magnetic docking arm to keep the spray head in place, a 2 function spray head and DIYer friendly installation if you want to install it yourself! Also I mean look at it, how pretty right? 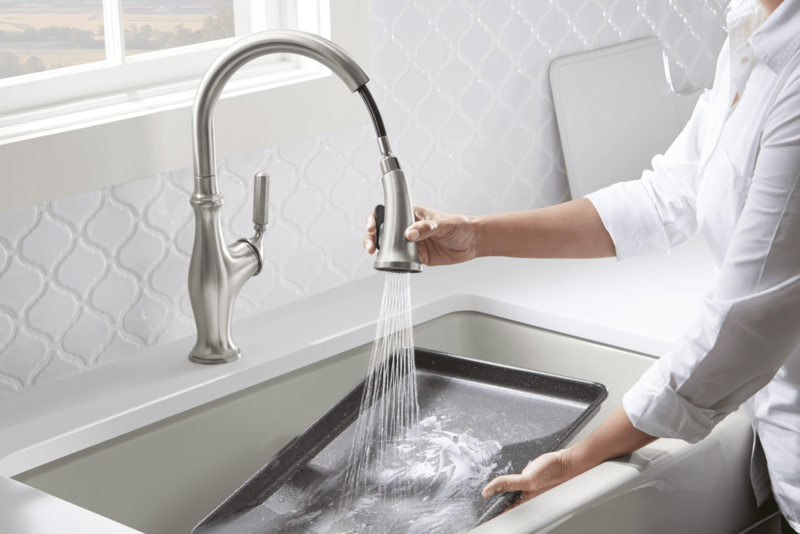 – Kohler Worth Kitchen Faucet – This one includes the magnetic docking as well as a MasterClean spray face with a flexible nozzle for easy cleaning. I am all about making kitchen cleaning easier, aren’t you? Kohler Trielle Kitchen Faucet– This is an assembled faucet that includes a soap/lotion dispenser and deck plate. It’s also DIYer installation friendly so you can install yourself and save some money! A new sink– In following with the new faucet I’d also love a new sink, a deeper on preferably! 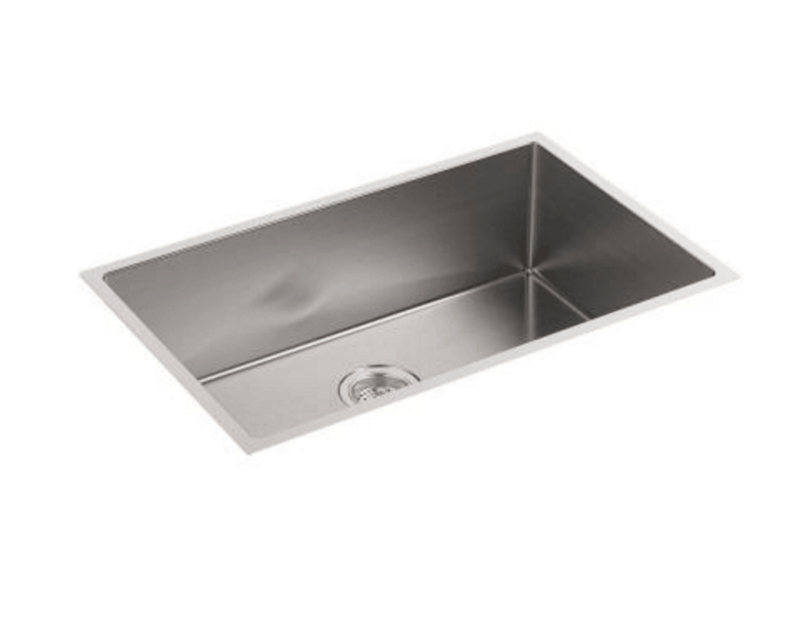 I love this beautiful Kohler undermount stainless steel sink! Granite countertops– I can’t wait until we get granite countertops. This will be a huge change to our kitchen and I can’t wait to see it. If you can’t tell I have a theme here, all of these replacements will have to be done at the same time! 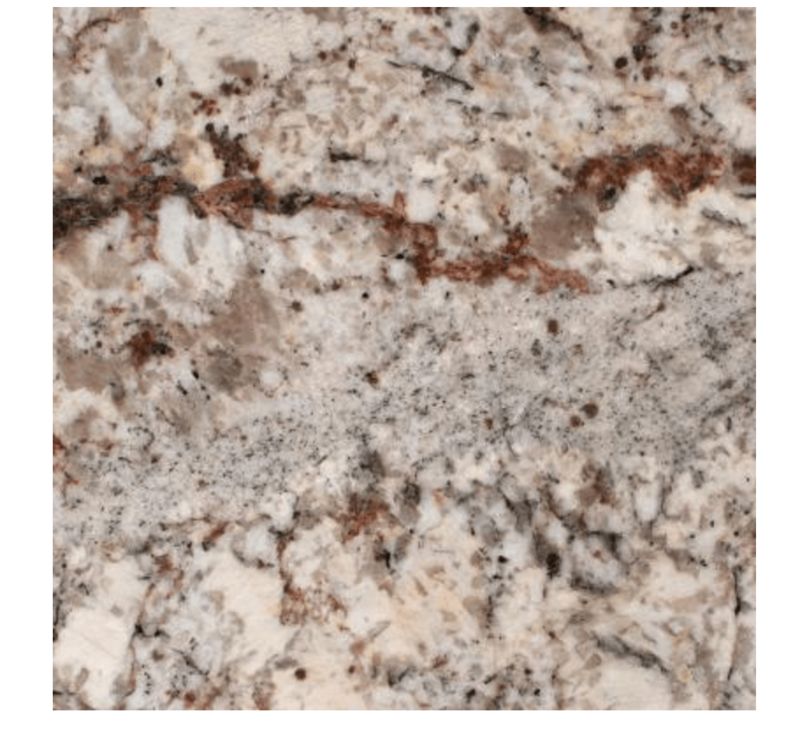 Part of my trouble with granite is I just cannot pick one I like for our kitchen, but I think this one is so pretty and a possibility! New appliances– Now here’s a part of our kitchen completely stuck in the 90’s if not even the 80’s. Our appliances are so old and outdated that Tyler had the same dishwasher as a child. I think my point has been made. 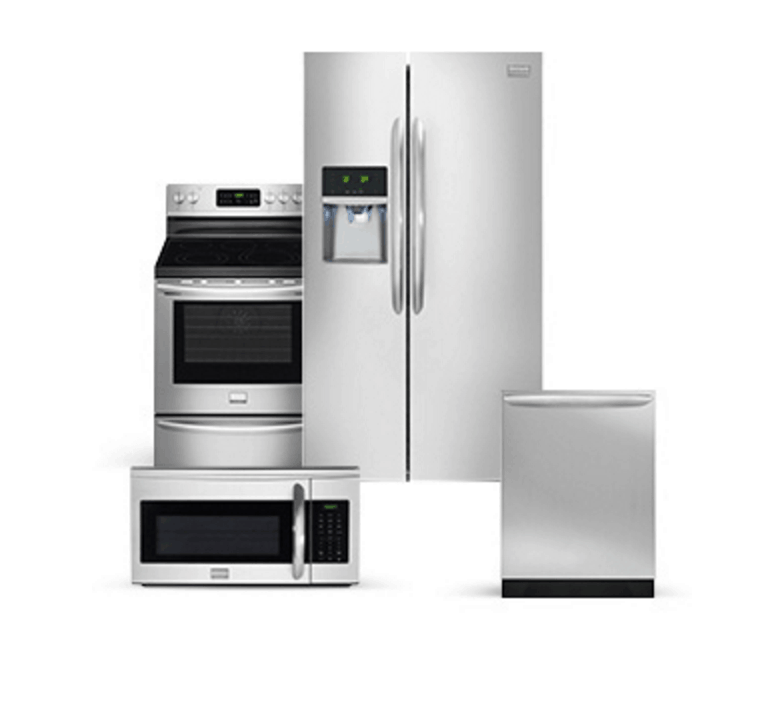 Stainless steel appliances are at the top of my list and would be such a dream come true! Lighting– I have big plans to change out the rest of the lighting in our house. The gold fixtures and the fan in my kitchen are just not for me. I love the look changing lighting can add to a house and look forward to switching up the lighting in my kitchen! These are the main things on my list for my kitchen inspiration. I am looking forward to when we can continue our overhaul of our kitchen. It started out with our repainting the cabinets and putting in hardwood floors which made such a difference. I am excited to see what things like a new faucet will add to this room! What are some dream items for redoing your kitchen? I LOVE thinking about kitchen re-design. I have a whole board on Pinterest dedicated to my dream kitchen! Everything from a pasta water station to a huge island for hosting fun parties. I would love one of those under-mount sinks. They look AWESOME! Actually, I would love a complete kitchen redo. I love the stainless too. The dollhouse has most of these items and we wouldn’t trade them for the world. The sink is amazing and probably our favorite. That granite color scheme is the best, it photographs so well. Stainless steel appliances although show EVERY finger print do clean up nicely! I love the farm sinks and concrete countertops. I really love the backsplash in the faucet picture. It isn’t something you see everyday. I’m not sure if this comment box is large enough to explain my kitchen re-do dreams! We just finished remodeling two bathrooms so it’ll be a little while until we save enough to tackle the kitchen…but when we do…oh boy! I have plans to expand it out about three feet into our existing dining room, increase the counter space, knock out cabinets…oh and the list goes on! It is truly amazing what a difference updating an appliance or faucet will do to the entire kitchen! I want to update to stainless steel appliances in our new home for sure! They are so pretty and clean looking! I love granite countertops. The bigger the better! I lack countertop space in my kitchen so not so secretly envious here. I dream of a kitchen makeover! One that includes new cabinets since ours are so old! But for now that is not our reality. Love the new faucets you highlighted form the Home Depot! We bought our house partly because I love the kitchen. I still do but if I could I would remodel to make it brighter with more windows. I love those kitchen faucets! I love how convenient it is and makes cleaning dishes much easier. We are wanting to replace our’s soon. We rent right now but if we didn’t I’d for sure be all over that faucet. I’m loving it and would kill for a granite kitchen. So beautiful. I want a kitchen makeover. I also really need a new sink and faucet. I hate ours it is awful. I just got a new faucet for my kitchen and I love LOVE it! It changes the whole dynamic of the kitchen! I am moving soon so this would be the perfect venture for us to be honest! I love the marble inspiration by the way! If we werent renting I would so redo my kitchen! Its not bad at all, there are just some things I would want to update. And I have decided that I do NOT like flat top stoves! My pans just dont work well with them! Ive always wanted a kitchen sink faucet like this! I love the design and efficiency! We just put in a new kitchen…. and we used the first one you recommended! I must be honest, It totally is the cutest, most efficient lovely faucet ever! Im still in the honeymoon period of enjoying everything about having a new kitchen! I’ve always loved their faucets! They’ve some of the most beautiful designs. I love that faucet! It looks so cool, yet seems so functional! I may have to get myself one, well, my husband would put it in, lol. I love kitchens that have a lot of stainless steel elements. Everything always look so clean and fresh!